For A Moment has tasteful melodies and organic arrangements that will surprise you. 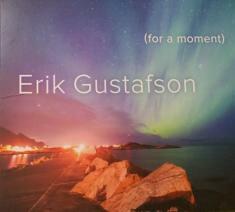 Pianist/composer Erik Gustafson is a talented musician with a passion for tasty New Age tones. His sound is organic, direct, and one-of-a-kind, and what really strikes me the most about his music is his ability to come up with ideas that are both innovative and simple at the same time. Gustafson is a talented musician who knows how to really make the most out of every note. Each and every moment of this release is filled with emotional intensity, and he has an uncanny passion for great vibes and unique textures. For A Moment is a really lush album which embodies Gustafson's ability to convey powerful feelings, as well as endless passion, with the simplicity that only a great songwriter truly knows how to embrace.